Most radiators in late model cars are aluminum. Years ago, they were mostly copper/brass. In the 1980s, only about 24 percent of all new domestic and import vehicles were equipped with aluminum radiators. Today, that percentage is almost 100 percent. Why the change to aluminum radiators? Because an aluminum radiator is much lighter than a copper/brass radiator: 5 lbs. versus 15 lbs. Empty. Aluminum radiators also contain no lead solder (which corrodes and is an environmental pollutant). The average service life of a typical aluminum radiator is actually about 10 to 12 years, which is about two to four years longer than a copper/brass radiator. Also, aluminum radiators are cheaper to manufacture. Copper/brass radiators actually cool better than aluminum (almost twice as good), but the added weight and higher cost of copper makes them too expensive. Radiator manufacturers have developed new, lightweight lead-free brazed copper/brass radiators that weigh less than the traditional lead-soldered radiators, but the cost is still high. These new copper/brass radiators are about 7 percent lighter and 15 percent smaller than an aluminum radiator of comparable cooling capacity. The new brazing technology for joining the tubes uses a copper/nickel/tin/phosphorus alloy which provides a stronger connection and is more environmentally friendly than lead solder. Brazing the tubes also eliminate solder bloom corrosion that can form inside older copper/brass radiators if the coolant is not changed regularly. The inside and outside of the new brazed copper/brass radiators are also electroplated to improve corrosion resistance, and the radiators are also easy to repair. Furthermore, the amount of energy needed to produce one ton of copper from copper ore is only about 40 percent of that needed to produce aluminum from its ore, so the overall energy picture for copper/brass is more favorable than that of aluminum. Both metals are also highly recyclable. Corrosion inside a copper/brass radiator. 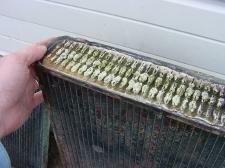 The most common reason for radiator failure is internal corrosion, which can have multiple causes. If the coolant is not changed regularly for preventive maintenance, the coolant can turn acidic and eat away the radiator from the inside out. The corrosion inhibitors in conventional green antifreeze are gradually depleted over time, and the recommended coolant change interval has traditionally been every two years or 24,000 to 30,000 miles. The new long life orange and yellow OAT-based antifreeze formulas can typically go 5 years or 150,000 miles between changes. Aluminum is more vulnerable to electrolytic corrosion than either copper/brass or cast iron because aluminum is a highly reactive metal. When the corrosion inhibitors in the coolant are depleted and the pH of the coolant drops to 7 or below, aluminum becomes a sacrificial anode and is eaten away. Checking the pH of the coolant with chemically-treated test strips can help you determine if the coolant is overdue for a change. The alkalinity of a typical antifreeze/water mixture will vary depending on the additives in the antifreeze and the ratio of ingredients, but is usually somewhere between 8 and 11. The average for most antifreezes is around 10.5, but when diluted 50/50 with water and added to the cooling system the pH drops to the 8.5 to 9 range. Higher is not necessarily better, though, because some of the new long-life coolants have a pH of only 8.3. A different type of corrosion can also occur in the cooling system even if the coolant is in good condition. Electrolytic corrosion can occur if the engine does not have a good electrical ground connection. Voltage from the charging system and ignition system will flow through the coolant to ground, creating electrolysis corrosion that eats away at the metal components in the cooling system. This may eat pin holes into the radiator or heater core and cause coolant leaks. It can even eat away at the inside of rubber hoses and cause them to fail also. This type of corrosion can sometimes be detected with a voltmeter. Place the positive test lead into the coolant, and touch the negative lead to battery negative terminal or body ground. If the voltmeter shows more than a few tenths of a volt, current is traveling through the coolant and may be attacking the cooling system. Check the engine ground straps for loose or corroded connections. If a ground strap is missing, replace it (or install an extra strap if one is not enough). Radiators can also be damaged by vibration that causes the end tanks or seams to crack and leak. Areas that are most likely to crack include the hose fitting connections, and the areas where the end tanks attach to the finned heat exchanger. Radiators can also be damaged by freezing if the coolant does not contain a high enough concentration of antifreeze and the outdoor temperature drops below freezing. Ice expands as it freezes and can split out the tube or end tanks on the radiator. Leaks may also occur in the automatic transmission oil cooler located inside the end or bottom of the radiator. ATF from the automatic transmission is circulated through a small loop of metal pipe inside the radiator to cool the fluid. Leaks here can allow coolant to mix with the fluid (which is bad for the transmission), or the ATF to mix with the coolant. The up front location of the radiator also makes it (and the A/C condenser) vulnerable to any stones or road debris that comes through the grille. A stone impact can have the same effect as if somebody shot a bullet into the radiator, and puncture the tubing causing the radiator to leak. Bugs, leaves and dirt can also build up on the face of the radiator and restrict airflow to the point where it may cause the engine to overheat. Spraying water or compressed air from the backside of the radiator can clean out the debris and restore normal airflow and cooling. Internal clogging due to a buildup of lime deposits or gunk in the cooling system, on the other hand, is not so easy to remove. If tubes in the radiator become plugged, it creates dead zones that do not provide any cooling. Plugged tubes can be detected by scanning the surface of the radiator with an infrared thermometer. Any area that reads cooler than an adjacent area when the engine is hot and running is not flowing coolant. Adding a can of cooling system cleaner may help, but it usually requires professional cleaning by a radiator shop to remove the blockages. The shop has to disassemble the radiator and rod out the clogged tubes to restore normal flow. Radiators can also be damaged in an accident. A frontal collision almost always damages the radiator. If the radiator is not punctured or crushed, it may be twisted, causing tubes or end seams to crack and leak. Small pinholes leaks can often be plugged by adding a can of cooling system sealer (such as BARS LEAK) to the coolant. But large leaks or leaks that cannot be stopped with sealer require taking the radiator to a radiator shop for repairs, or replacing it with a new one. 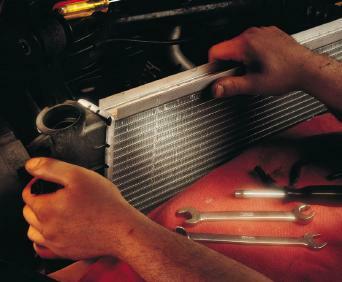 Internal corrosion damage usually required replacing or rebuilding the radiator. But small leaks can be repaired a variety of ways depending if the radiator is aluminum or copper/brass. The cheapest fix, of course, is to try adding a bottle of cooling system sealer to the coolant (via the radiator cap or coolant reservoir). If that fails to stop the leak, the radiator will have to be patched, rebuilt or replaced. Solder bloom is a type of internal corrosion that can form when neglected coolant, rust and some types of leak inhibitor additives react with the soldered joints in a copper/brass radiator. White to green crumbly deposits begin to grow, which can block tubes and restrict the flow of coolant. A radiator with this kind of problem must be recored or replaced. The cooling system should be cleaned and flushed to remove deposits and sediment. Leaks caused by punctures in an otherwise health copper/brass radiator can usually be patched by soldering, brazing or even sealed with epoxy or specially-formulated high temperature hot-melt adhesive (which is not the same kind of adhesive used in a home hot glue gun. Aluminum radiators can also be repaired by soldering, brazing or welding, but it takes skill and special materials. Epoxy or a special high temperature hot melt wax (available from the Barbee Co.) are other repair alternatives that can achieve good results on aluminum. Leaks in plastic end tanks can be filled with epoxy, covered with fiberglass and epoxy, or hot air welded using nylon plastic filler rod. Welding plastic takes some skill and requires careful surface preparation to get good adhesion. The leak must first be "V" ground and sanded, then cleaned with wax and grease remover to assure a strong bond. The other alternative is to simply replace the damaged end tank. But the job is harder than it looks because the end tank must be pressed down on the core with about 150 lbs. of pressure while the header tabs are clamped in place. Radiator shops have the proper fixtures for doing this kind of work. same or greater cooling capacity as the original radiator. (all hoses, water pump, fan, fan clutch and thermostat). The first step in replacing a radiator is to drain the cooling system. Open the drain valve on the radiator, and catch the old antifreeze in a bucket. Then dispose of the old coolant properly. Some recycling centers accept used antifreeze. Do no dump it on the ground or pour it down a storm sewer. In many areas, used antifreeze can be safely disposed of by flushing it down a toilet (an added bonus with this method is that antifreeze kills tree roots and helps keep sewer lines open). If the cold coolant contains any sediment or rust, the cooling system should be flushed with a chemical cleaner before any further disassembly. All of the cleaner should then be flushed out of the engine and cooling system with plenty of clean water. The old radiator can now be removed by disconnecting the upper and lower radiator hoses, the ATF oil cooler lines (which requires using flare nut wrenches if you don�t want to damage the fittings), removing the fan shroud or cooling fan, then unbolting the radiator support brackets. On some newer vehicles, the radiator is attached to the A/C condenser, making it much more difficult and expensive to replace. If the radiator is being replaced, the new radiator must have the same width and height as the original, and the same cooling capacity. Some replacement radiators may actually be thinner than the original because they use a more efficient tube and fin design. When bolting the radiator in place, check for misalignment between the mounting brackets and radiator support. Misalignment can crease stress that may lead to fatigue cracking and radiator failure. Also, inspect the condition of all belts and hoses. Now would be a good time to replace the hoses and clamps if they are more than six years old. Any hose that has cracks, bulges or soft spots must be replaced. Also, make sure hoses are properly positioned and supported to minimize stress on the radiator connections. Make sure you replace the fan shroud or any other ducting that was originally on the vehicle if it has a mechanical cooling fan. Leaving off a fan shroud can significantly reduce the radiator's ability to cool the engine at low speeds when most of the airflow is generated by the fan. A new cap is also recommended for a new radiator. Make sure it has the same pressure rating as the original. If the engine overheated, the thermostat should also be replaced. Too much heat usually damages the thermostat. Note: Some thermostats have a jiggle pin or small bleeder hole that vents air making filling easier. Others do not, and can trap air causing the engine to overheat. I always use a jiggle pin thermostat, or drill a small hole to create a vent if a jiggle pin style thermostat is not available for the application. When refilling the cooling system, use a 50/50 mixture of fresh antifreeze and clean water (distilled water is best). 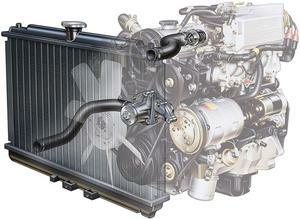 With older copper/brass radiators, green coolant usually provides the best protection. For newer radiators, use a green coolant with silicate inhibitors, or an OAT-based orange or yellow antifreeze. Getting all the air out of the system is essential for proper cooling, so look for any air bleed valves on the thermostat housing, intake manifold or elsewhere that might need to be opened to vent air while you are refilling the cooling system with coolant. When everything is back together, and the cooling system appears to be full, start the engine and check for leaks as the engine warms up. Make sure the cooling fan comes on when the engine reaches operating temperature. Then shut the engine off, let it cool for an hour or so, then add additional coolant if needed to top off the system. Your Temperature Warning Lamp Is On. What Should You Do? Universal Coolant: One Antifreeze For All?